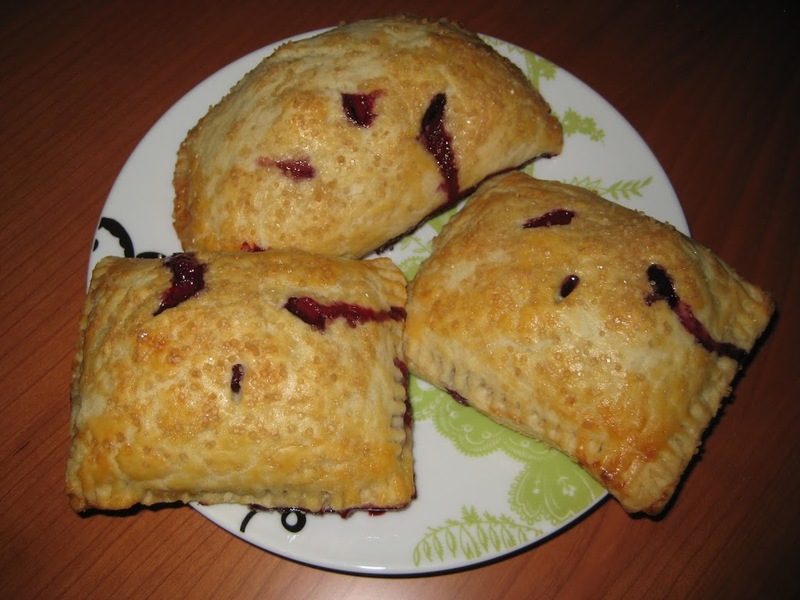 Blueberry Cream Cheese Hand Pies! So, I tried to get this recipe posted last week before I left for Yosemite (visiting the boyfriend) and Fresno (old roommate’s wedding), but I just ran out of time. I made these little hand pies after I had experimented with some sour cherry ones at the bakery. I came home, and we had a ridiculous amount of blueberries in the fridge that were calling to me to be baked into something. As I’ve already mentioned, we are a pie family. I’ve been assisting in pie making since before I can remember, and only now that I’ve started working at the bakery have I been kind of branching out a bit from the dubbed favorites. Blueberry has always been a favorite, but I got to mix it up a bit by adding the creaminess of the cheese, and cute hand pie shape. 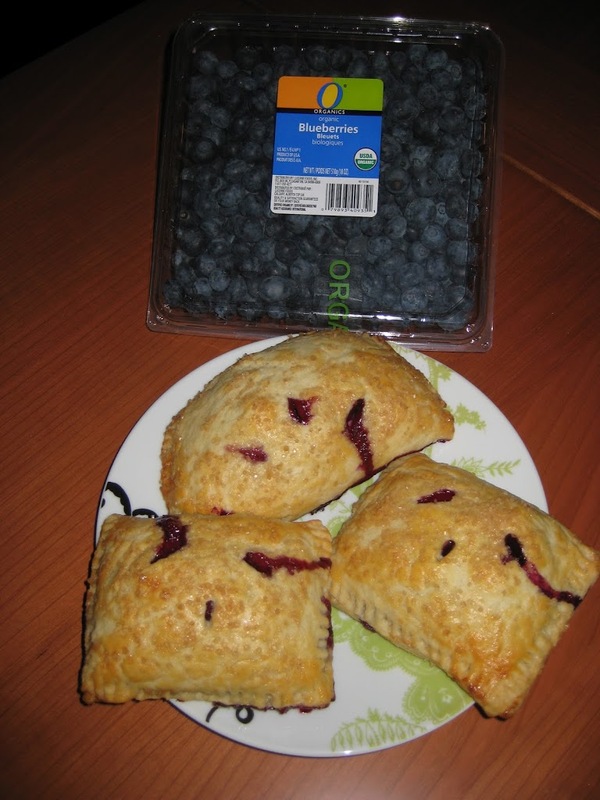 You could pretty much do any fruit in a hand pie if you don’t have blueberries. Try cherries, blackberries, even peaches would be good (which is what I might try now that I have a GIANT box of peaches I picked up from my old roommate’s family after the wedding). They’re simple, but uber yummy! Put the flour and salt in a large bowl, and stir together with a fork or a pastry cutter. Incorporate the butter and shortening into the flour mixture with a pastry cutter until there are no more pieces of butter larger than a pea (should be a fairly crumbly mixture, but don’t worry if you have some pieces larger than others). Ree’s recipe says it should take 3-4 minutes, but it really just depends on how you’re doing it. 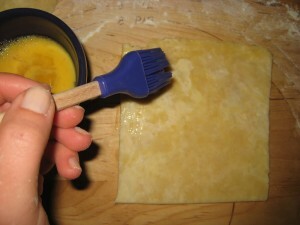 Beat the egg in a small bowl with a fork, and using a spatula or a spoon, gently mix it into the butter/flour mixture. Then add in the water and vinegar. Using your hands like small shovels, scoop the mixture from the bottom of the bowl to incorporate the dry into the wet. Stir until it is all just combined. Then form into a ball, cut it in half and wrap each portion in plastic wrap. Stick it in the fridge for at least an hour. Place the blueberries in a medium mixing bowl, sprinkle with lemon juice and granulated sugar. Set aside. 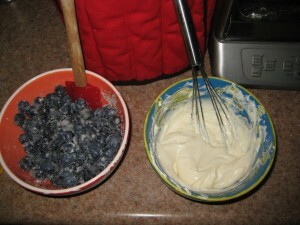 In a small bowl, whisk 3 tablespoons powdered sugar into the softened cream cheese until smooth. Then whisk in the vanilla. Taste the mixture, and if you want it sweeter, add more powdered sugar. Preheat the oven to 375 degrees, and line a baking sheet with parchment. Roll out each of the balls of pie dough into rectangles. 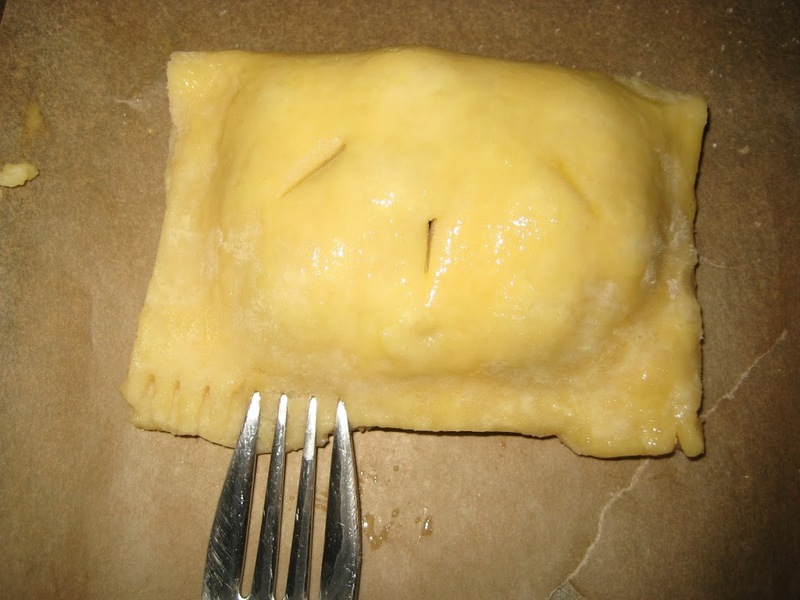 Using a sharp knife, cut into rectangles about 6” X 5”(should be enough for 12 hand pies). Add a splash of water to the egg, and whisk together until smooth to create your egg wash. 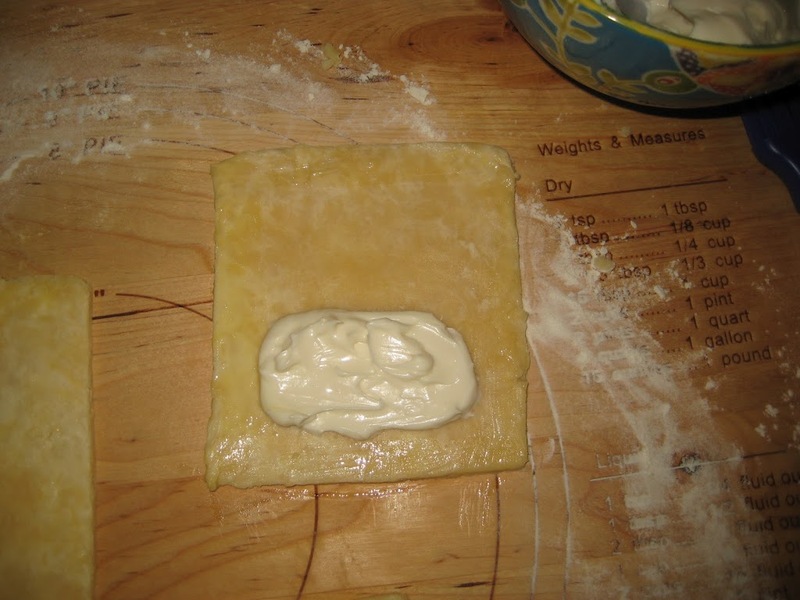 Using a pastry brush, paint the edges of the dough with the egg wash.
Then, dab about 2 tablespoons of the cream cheese mixture on one side of the rectangle, being sure to stay far enough away from the edge so that it can be crimped closed. Place about 2 tablespoons of blueberries on top of the cream cheese, then fold the dough over top so that the edges line up. 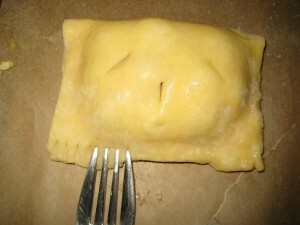 Using a fork, crimp the edges so that the pies are sealed. Then use a knife to cut 3 slits in the top for ventilation. Once all your pies are assembled, brush the tops with egg wash and sprinkle with coarse sugar (if you have it, if not just regular sugar works). 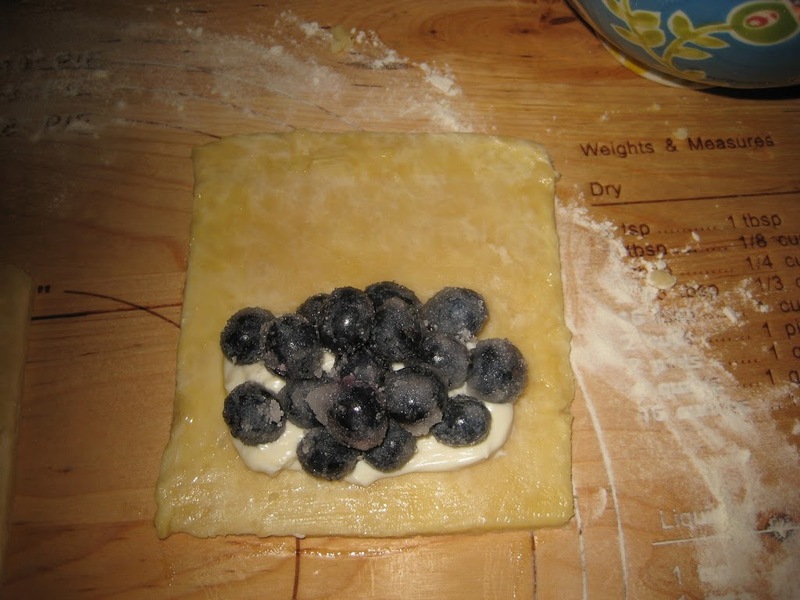 Bake them for about 20 minutes, or until the dough has browned slightly and the berries have begun to bubble a bit. Eat them slightly warm, or at room temperature.